Guardian enables you to create source and destination filters which are used when applying upstream proxy policies. Guardian uses destination filters to determine which upstream proxy policy to apply based on the destination domain(s), IP(s) or destination URL regular expressions. 1. Go to the Web proxy > Upstream proxy > Filters page. • Type — Select Destination. • Name — Enter a meaningful name for the destination filter. • Comment — Optionally, enter a description or comment. • IPs/Hostnames — Enter a destination IP address or hostname. 3. You can use regular expressions to specify the destination for some URLs. To do this, click Advanced. 4. Within Destination regular expression URLs, enter one regular expression URL, including protocol, per line. Note that the full URL is not available for HTTPS requests. 6. Repeat the steps above to add more destination filters. Guardian uses source filters to determine which upstream proxy policy to apply based on the source IP(s), subnet(s) or IP range(s) of the client machine(s). • Type — Select Source. • Name — Enter a meaningful name for the filter. • IPs/Hostnames — Enter a source IP address, IP address range, network address or hostname. Hostnames require reverse DNS look-ups to be performed. 3. Click Save. 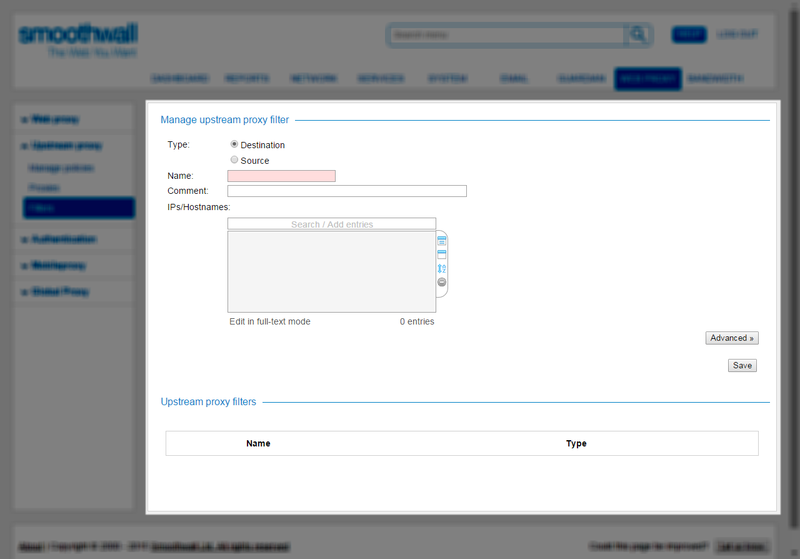 Guardian adds the filter and lists it in the Upstream proxy filters area. 4. Repeat the steps above to add more source filters.